Don’t throw it away! Don’t chip it! Don’t burn it! Do what lovers of backyard wildlife do — throw limbs, branches, twigs and brush in a pile and ignore it. This isn’t to say you should never recycle wood by chipping and using it for mulch. But save some for a brush pile. It will provide something special for nearly every critter in your backyard wildlife habitat. Escape routes for animals being pursued by predators. Birds and dragonflies will perch on the tips of branches. Insects and lizards will sun themselves on outer surfaces. Birds, squirrels, opossums, toads, snakes and others will scour it for the insects that inevitably take up residence. Butterflies may spend the night, tucked into crevices, or even hibernate there over winter. Opossums, raccoons, others may use it for dens. On a hillside, it helps hold soil in place. 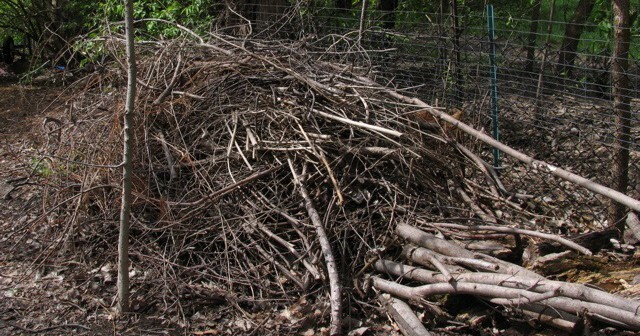 Begin with a layer of large branches, loosely stacked parallel to each other. Don’t use treated lumber, railroad ties or lumber containing lead. You can also use stones in the base. Top the base with smaller branches and twigs. When you trim shrubs, add the trimmings to the pile. Every year the pile will shrink a little as wood rots and falls apart, so you can just keep adding to it. 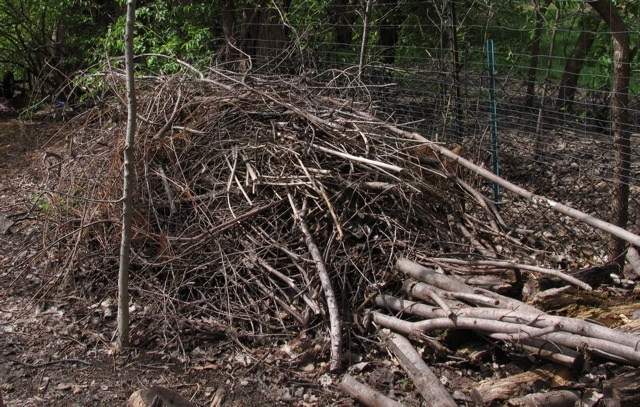 Screen the brush pile with plants that offer something beneficial to wildlife, such as fruiting native shrubs and nectar plants for butterflies.